by Laurel Robertson, Carol Flinders and Bronwen Godfrey. One February day I committed to making a weekly stone soup, a promise to feed my family and one other. My pledge was made in alarm over the number of people lining up in the neighborhood to receive free food each week. Since then, I’ve made seven pots of soup, sharing the recipes with you and sharing a second set of ingredients with the local food bank. Between this week’s bookends of warm days, it snowed and I made soup, a pea soup the same dusty green as the awakening apple tree and flavored with the ham bone from Easter. It was a deliciously thick with baby lima beans and chewy barley, and we ate it all before I could take a picture. As I thumbed through “Laurel’s Kitchen” to pass the recipe along to you, I was diverted by the essay in the front of the book. It’s an essay I’ve read many times, but this time it resonated in a new way given the uncertainty of our world, our jobs, our homes. 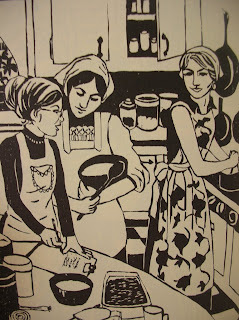 Written in the 1970s, it was arguing that American women held the key to the food and resource crisis. A neighborhood that meets its needs cooperatively takes a much smaller bite out of the world resources. Car pools form naturally; a communal garden springs up. Joint wholesale food purchasing comes easy; families may even find they can live under one roof. One lawnmower, one Rototiller, one sailboat does for a whole block. The barter system can flourish: fresh-baked muffins for minor car repairs, knitting lessons from the elderly lady down the block in exchange for a lift to the grocery store. … Outgrown clothing gets passed around among the children until it’s threadbare and gradually, in the evening, people can even be seen out-of-doors, visiting with one another… Women are the people who can best accomplish these changes, by bringing warmth, self-sufficiency, and interdependence to our homes and communities. Soup weather’s thawing, days are warming, lengthening, and so is the food line. I’m getting pulled away from recipes and into the garden where seeds are hidden. What does this mean for me and my promise? Why not turn that future crop of zucchini into a cold ratatouille, you ask? Because I hold serious doubts about my abilities as a farmer. Like a ground squirrel I bury seeds only to forget about them for weeks and then later wonder why the squash isn’t growing. But I will forge (or forage) ahead into the world of lighter soups, cooler soups, soups that still hold a stone in the bottom of their bowls. Note: While the original recipe is a delicious vegetarian soup, I couldn’t resist using the ham bone from Easter dinner. Saute onion in oil until soft, along with bay leaf and celery seed. 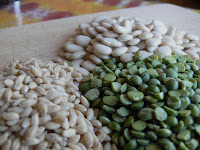 Stir in peas, barley and lima beans. Add optional ham bone, 10 cups water and bring to a boil. Cook on low heat, covered, for about one hour and 20 minutes. Add salt, pepper, vegetables and herbs. Turn heat down and simmer another 30 to 45 minutes. Thin with additional water or stock if necessary.